The USS Oriskany was on its first Korean mission when disaster struck its deck. It was caught on film, as seen in this video. How and why did it happen? The Oriskany had a bumpy start, undergoing several changes and overhauls during its construction. Work on the ship was actually suspended in 1946, before the job could be finished. The vessel was then redesigned and torn down from 85% complete to only 60% complete. Aircraft technology was changing as the years went on, and it was decided that the Oriskany should be updated to allow it to handle newer models of planes. To this end, the flight deck was heavily altered and reinforced, and more advanced arresting gear was built in. At last, years after its construction began, Oriskany was finished. The ship was officially commissioned at the New York Naval Shipyard in 1950, on the 25th of September. Captain Percy H. Lyon was in command of the vessel, and its time in active service had begun. The same year that the ship was commissioned at last, the Korean War broke out. North Korea opened hostilities by invading South Korea, and the United States – spearheading the efforts of the United Nations – joined the conflict on the side of the latter. However, China and the Soviet Union later threw their weight behind North Korea, and the stage was set for a bloody three year war. Defined by continuous reversals of fortune on both sides, the early months of the war saw North Korea winning decisively. However, just as their enemies seemed to be teetering on the edge of defeat, United Nations troops entered the struggle and turned things around. Soon the North Koreans were falling back, withdrawing rapidly towards the border. At this point, Chinese troops began flooding across the Yalu River, and the American-led push towards North Korea was repelled. The various factions involved continued to move back and forth, with the South Korean capital – Seoul – changing hands four times as time dragged on. The Oriskany incident took place in the final year of the conflict. Two days before the event took place, the ship was near Wonsan, a port city lying in a deep bay. From there, the aircraft carriers sent planes for small strikes against supply depots. The next day they were on their way north to Hungnam for a larger attack and a series of heckler runs up and down the coast. The day after that, March 6, 1953, they turned south again, bombing trenches, depots, and bunkers near Hamsong. 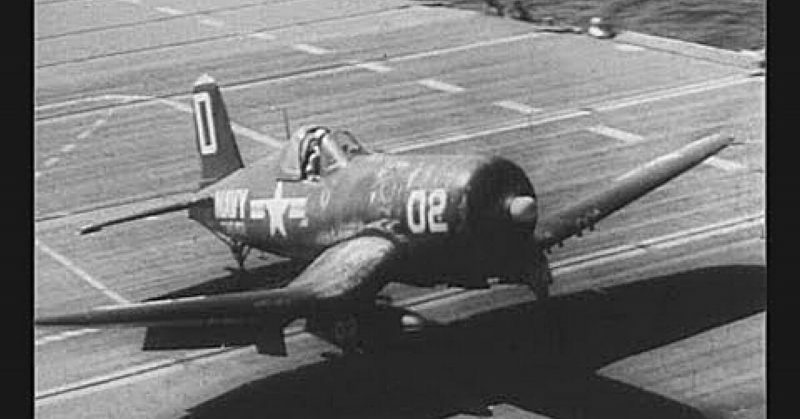 On the third day of airstrikes, while in flight, Lieutenant Edwin L. Kummer of the VF-124 Gunfighters began to experience engine trouble with his Vought F4U Corsair. Turning back to the Oriskany, he tried to jettison all the ordinance but nothing happened. A 250 lb. bomb was stuck in the rack and would not budge. Although it sounds dangerous, this problem was common. Lt Kummer was given permission to land with the bomb still in the rack. As he landed, the bomb broke the confines of the rack, bounced twice on the deck, and exploded over the No. 3 elevator. Fourteen men were injured and two were killed: the camera man, Airman Thomas Leo McGraw Jr. and Aviation Electrician Airman Thomas M. Yeager who was working on a Panther at the time of the unfortunate landing. Down below in the hangar deck, shrapnel flew into parked aircraft, gasoline flooded the bay, and a fire broke out. Firefighters worked quickly on damage control and were able to save the ship. Meanwhile, Airman Richard D. Donovan braved the flames to cut Lt. Kummer from his harness and help him from the plane, saving his life. The Oriskany was back in action the next day.